Collection of personal tweaks and fixes from The Witcher 3 dev. Mod mainly aims at fixing immersion breakers, buffing underperforming skills and items, cosmetic changes and bugfixing. It also fixes few instances of items and abilities that made Geralt (nearly) immortal and removed all the challenge from the game. If you like specific parts of the mod but not the mod as a whole, you are free to pick these parts and release them as a separate mod. Just remember to credit me as original author. Compatibility fixes include merged scripts for mods they are meant to be used with. I uploaded them in good heart for ease of use, since creating them took some time and I did it for myself anyway. I'm not the author of parts of code used in compatibility patches and I'll remove these patches immediately on request. Removed missed def_loot_containers files from DLC folders. Fixed vanilla game bug with Aard damage from Shockwave not being added when Piercing Cold effect is triggered but fails to insta-kill opponent. Fixed a bug with Aard damage from Shockwave not being the percentage value as described in skill when Piercing Cold mutagen is active. Fixed vanilla game bug with Synergy skill not providing synergy bonus to mutagen itself (despite it being displayed in skill panel), only to skills. Fixed a bug with Synergy skill giving 10% per level bonus, instead of 16.67% bonus that was displayed in skill panel. Fixed reported cases with item prices not being displayed as halved with Reduced Loot packages. Changed follower increased damage to be based off of the lower of either player or victim level. Should improve the exerience when the game is played without enemy upscaling option. Removed def_loot_containers and boid_species files from main mod package for greater mod compatibility (def_loot_containers is still kept in Removed Loot package). Added optional compatibility patches between FCR3 and Friendly Stash mod. Buffed Retribution glyphword. Description says it returns some damage of the attacker, in reality it deals damage based on Geralt's total armor value. Buffed the value from 50% of armor value to 100% of armor * 1/10th of player level. Katakan decoction increases critical hit chance by 10% (up from 5%). Leshen decoction reflects 10% of damage dealt by enemy (up from 2%). Grave hag's decoction increases Vitality regeneration by 10 per enemy slain (up from 5). Reliever's decoction blocks specter's special abilities, like ethereal forms and teleports upon hitting them on top of its vanilla bonuses (string 1083121). Fixed Friendly Hud compatibility patch script compilation error. Fixed a very rare bug with Cat effect (darkvision) being permanently turned on. Works retroactively on already affected savegames. Fixed reported rare cases of unlootable containers with Reduced Loot package. Increased Sign intensity to enemy resistance ratio required for heavy knockdown -- the one allowing to instantly kill knocked enemies. Insta-kill knockdown now requires dedicated Signs build. Increased chance of reaction to theft. Partially fixed a bug in Woodland Beast quest: "When you give up your swords and then kill the elves, you can't retrieve your weapons from the box and the quest is forever stuck at 'retrieve weapons' and your weapons are also lost." Player can retrieve all the items taken away from him but for reason unknown to me quest still doesn't progress further. I'm afraid that's as much as I can do in this case. Fixed interaction between Adrenaline Rush, Blizzard potion and Delayed Recovery skill allowing to infinitely cast Signs and perform Whirlwind attack. Fixed Possession skill description error. Removed "while at max Vitality" condition in Adrenaline Rush mutation. Fixed frame drops and camera hitches when using witcher senses in Fisherman's Inn and potentially in other very densely populated areas. Fixed Piercing Cold mutation description not reflecting how freeze chance is calculated (string 1188309). Loot item level is now upscaled to highest enemy level in the area if enemy level is higher than player level. Fighting higher level enemies guarantees high level drops now. Static Discharge skill now removes a portion of enemy's current health instead of dealing very low flat damage. Damage depends on Sign intensity and can vary between 2% (lowest possible) and 10% or more of current enemy health per cast on maxed out Signs build. This makes casting Aard with Static Discharge a very good idea against tanky enemies, especially at the beginning of combat. Strings 1066965, 1066966, 1066967 updated to reflect the change. Doubled Supercharged Glyphs damage scaling. The damage was symbolic and still is but should be more worthwile to invest in it. Changed the way chance to apply burning effect is calculated for base Igni Sign. Sign intensity impact on chance is now logarythmic, instead of linear, which means that high Sign intensity will result in diminishing returns. This makes Pyromaniac skill useful as only with Pyromaniac player can ever reach 100% chance to apply burning. Piercing Cold mutation freeze chance is now scales up to 30% (up from 25%) but depends on amount of Adrenaline. Chance scales all the way, not only when full Adrenaline Point is gained. This change is meant to make you earn insta-kill chance, not just randomly one-shot enemies from the start of combat. Arrow Reflection double damage bonus is now applied at 2nd level of the skill (current max 2/2). It should make this skill more useful. Fixed a known mod bug with crossbow bolts level being doubled or trippled on pickup before it fixes itself after fast travel or loading from saved game. Bolt item level is now properly calculated on pickup. Fixed mod bug with non-lootable container in Family fortune treasure hunt quest with Reduced Loot package installed. If similar issue occured in other quests fix will also work for them. Cleared scripts from dev comments for easier merging between mods. Fixed remaining issues with Reduced Loot package emptying PoI and tresure hunt containers. Added a fix made by frasdoge to cosmetic interface issue in character development screen where padlocks indicated wrong amount of invested skillpoints needed to unlock another row of skills. Thank you for your help, frasdoge! Added a failsafe against emptying containers near treasure hunt mappins in Reduced Loot mod packages. Tresure hunt quests should work fine now. Fixed a bug with item tooltips in shops showing half of the actual buy price with no Reduced Loot packages installed. Added a version of Reduced Loot package that has 100% chance of emptying containers with low quality, generic loot tables. Tresure hunt containers and containers with high quality loot, quest items, readable items and keys are not affected. Added Regis to followers damage calculation fix. Fixed vanilla game bug in "The Night of Long Fangs" Blood and Wine quest, where Regis doesn't help Geralt while he's being attacked by some enemies. Fixed Dumpling runeword food item tooltip incorrectly showing duration bonus with Reduced Loot + Friendly Hud package installed. Buffed Second Life mutation by reducing effect cooldown from 180 sec to 60 sec. Effect immortality buff lasts 10 seconds (unchanged), so effective downtime is 50 sec. This might seem very powerful, or not still not powerful enough, but pushing it further might end with total immortality, while keeping longer cooldown results in nobody using this mutation. Buffed Metamorphosis mutation by increasing number of bonus decoctions cap from 3 to 5. This is a very costly mutatation with its cost implying that it's very powerful. It didn't feel like it and very few people ever used it. Mutation description updated to reflect this change (string 1188321). Added a failsafe against emptying containers with readable items in Reduced Loot mod package. 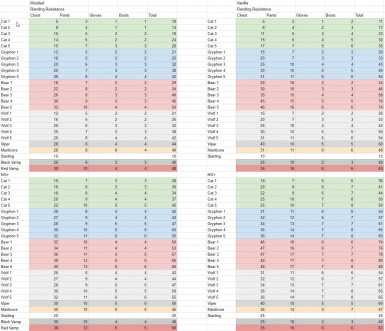 Halved enemy resistances bonuses per level against Signs in NG+. Applying critical effects in NG+ was (close to) impossible due to resistances reaching and exceeding 100%. That said, this change shouldn't make the game easier than it is in NG, it just ensures that enemies in NG+ are as resistant to Signs as in NG. Added additional failsafe against emptying containers with quest items in Reduced Loot mod package. Still, it's possible that some treasure hunt or POI containers might end up empty with this package. If it happens it means that these containers use low quality ("junk") loot table. Fixed Dumplings runeword healing buff and incorrect buff indication displayed in item stats. Increased critical hit chance value in enhanced and superior Cat potion. Added French translation. Mod translated by fwou. Thank you for help! Updated compatibility patches to new version of Friendly Hud mod. Added an optional download package with reduced loot. All containers that are not considered treasure, unique, quest, special named and money have 85% chance of being empty. Drops from killed enemies are not affected. Shop prices are halved to compensate for the loss in items to sell and items that you'll now need to buy. Fixed mod bug with remaining cases of friendly NPCs dealing way too high or way too low damage. Fixed a very rare vanilla timescale bug that caused all slowmotion effects from skills and items speeding up Geralt instead of slowing down time. Meditate in game to fix this issue. Fixed vanilla game bug with Flood of Anger skill not buffing Signs skills that are learned but not slotted and not upgrading slotted skills that are below max level. Fixed vanilla game bug with Flood of Anger skill not adding Exploding Shield and Quen Discharge skills for the duration of Quen shield (worked only on cast, ignored duration). Fixed vanilla game bug with Flood of Anger skill not adding Supercharged Glyphs skill for the duration of Yrden trap (worked only on cast, ignored duration). Fixed vanilla game bug with interaction between Flood of Anger skill and Rage Management perk. Fixed mod bug with interaction between Adrenaline Rush mutation, Rage Management perk and Flood of Anger skill. Supercharged Glyphs skill damage is now scaling with enemy max health in addition to vanilla damage value. Skill description updated in English and Polish language to reflect this change (string 1066972). Changed projectile damage of special attacks being a fixed value throughout the whole game. It now scales with level. Fixed physical projectiles from special attacks not dealing damage to monsters, ie. Kiera's "rock barrage" attack. Djinn is not affected by enemy upscaling option. Added console command that will completely reset character development, including reloading xml definitions affecting skill max levels. Type "ResetCharacterDevelopment" or "rcd" (lazy version) without quotation marks in console to activate it. You'll know that it worked from camera shake effect. After typing it save after reload the game. Fixed Friendly Hud and Friendly Hud plus All Quest Objectives on Map compatibility patches forcing free respec on each loading of the map. Fixed grandmaster set bonuses not counting on all witcher sets items in New Game+. Fixed vanilla game bug with Hunter Instinct skill not properly adding critical hit damage. Fixed vanilla game bug Rejuvenation runeword increasing maximum stamina beside also regenerating it on kill. Added a failsafe to prevent Rejuvenation runeword bug from happening on Elation runeword (just in case). Increased Melt Armor armor reduction value to retain vanilla game balance. Increased Hunter Instinct critical hit damage value to retain vanilla game balance. Added Polish translation. Mod translated by Szukar. Thank you for help! Fixed increased enemy fistfight damage in comparison to vanilla game. Reduced damage dealt by followers and some allied NPCs in combat. They were meant to behave in a believable way and contribute in combat but ended up overperforming. This change doesn't affect sorceresses and witchers. Reduced fall damage dealt to mini-bosses shot down from the sky. Damage scales depending on altitude up to 1/3 of max enemy health (down from 100%). Reduced werewolf regeneration in The King of the Wolves quest in NG+. Fixed human npcs not having stats (zero health, -1 level) in NG+. Hey, I'm a senior gameplay designer and I worked on The Witcher3 and both expansion packs. This mod used to be a personal set of tweaks and fixes meant to spice up my first The Witcher 3 playthrough after releasing the game. Being in creation for more than half a year and enjoyed during >300h playthrough I thought that I might share it with witcher community. Mod doesn't aim for any deep and intrusive changes, instead it is meant to maintain original feeling of the game, sometimes going closer to original intention behind the designs. It focuses mainly on fixing immersion breakers, buffing underperforming skills and items, cosmetic changes and bugfixing. It also fixes few instances of items and abilities that made Geralt (nearly) immortal and removed all the challenge from the game. Because mod affects character development, Geralt's abilities will be reset and skillpoints returned just as in case of free respec. It also comes with few compatibility fixes for other mods that I've been playing with. Installing the mod in the middle of a playthrough should be completely safe, unless you are already using other mods affecting gameplay. For installation directory, Nexus Mod Manager handles it automatically and I thoroughly recommend using it. To forcibly reset character development and skill definitions type "ResetCharacterDevelopment" or "rcd" (lazy version) without quotation marks in console to activate it. You'll know that it worked from camera shake effect. After typing it save and reload the game. For all OCD players (like me) that feel the need to pick up everything and are tired of it, FCR3 comes with an option to reduce amount of filler loot. All containers with generic low quality, junk loot tables will be empty unless they are connected with quest or Point of Interest. Drops from killed enemies are not affected. Shop prices are halved to compensate for the loss in items to sell and items that you'll now need to buy. This feature is optional since it doesn't follow the philosophy of the mod - focus on polishing and tweaking and maintaining original feeling of the game. This feature changes that feeling. You can consider it a quality of life change and a time saver. Price change is really needed only when you play with loot reduction from the beginning of the game. Adding it in the middle of playthrough you might have already accumulated enough money. In such case, if you want to remove price change, just remove scripts folder from mod installation folder. Reduced loot won't work on retroactively on already discovered containers, as their content is already decided and saved by the game. Reduced loot package comes in two versions - regular and compatbile with Friendly HUD by wghost81. If you are using just these 3/4 mods, there's no need to merge scripts, because compatibility fix overrides files creating conflicts. Also in my case I didn't use any mod manager beside NMM and I didn't edit mods.settings to enforce the priority. Game loads mods alphabetically and mod names already load in proper order after being installed from NMM. To return to vanilla character development after uninstalling the mod, please install "uninstallation" package, load and resave savegames affected by FCR3. This should revert all of the mod changes and provide you with another free respec. After resaving the savegame you need to remove uninstallation package or it will keep respecing Geralt each time you load the game. When switching to new version of the mod, you don't need to follow uninstallation procedure. The way "Dark places" are implemented in the game is prone to human error. Each one of them is marked with a trigger area. Because this is not a code solution, because it's not automated but done by hand, there are dark places that are not marked. Night vision doesn't work in such places but vanilla Metamorphosis mutation doesn't work as well. I cannot fix it unfortunately as this would require editing the levels. Bunch of features that added to ‘wow’ factor and changes for things that bothered me. • Metamorphosis mutation effect "Witcher Senses now increase visibility in dark places without the use of potions works" works without the mutation. In combat it works automatically, while outside of combat it can be activated in focus mode. Witchers see in the dark. All of them, no potions needed. It’s in lore. • Added reaction to stealing for commoners. There are two severities of reactions and two results for each of them depending on npc AI. Commoners will react depending on the priority of tasks they are undergoing at the moment. The effect is that some of the npcs will ignore you stealing stuff, others will call you out on it, some will just stare. There will be also rare cases when someone will be become intimidated, cover in fear or possibly run away. The effect is especially visible in Novigrad, less in Skellige and least in Toussaint, where even guards ignore player stealing. • Increased minimal height from which fall damage starts to be applied. • Made Ciri immune to damage while she's performing special 'teleport' charged attack. Could be considered as a bugfix. • Allied NPCs (followers) deal full damage to enemies (used to deal minimal damage). • Buffed sorceress and witcher followers damage. These are the most powerful characters in the setting, you should feel that now. • Reduced level bonus of guards from player level plus random 11-13 to player level plus random 0-5. A random guard shouldn't pose a threat to legendary witcher. • Sped up animations of flying monsters falling down after being shot from the sky. • Added fall damage on ground contact for monsters that were shot from the sky. Damage depends on the height from which they fall. Boss enemies take up to 1/3 of their max health, regular enemies up to full health. • Allowed to bounce majority of the physical projectiles with Aard hit. • Signs buffed by Flood of Anger skill cause enemy explosive dismemberment on kill. • Sorceresses now dismember enemies on kill. • Fixed majority of rare cases where Geralt jumped after hitting ground while playing death animation. • Fixed some of the cases for sorceresses where spell visual effect remained on hand after combat. Still not sure if all instances were fixed but should be better. • Fixed vanilla game bug in "The Night of Long Fangs" Blood and Wine quest, where Regis doesn't help Geralt while he's being attacked by some enemies. • Added an optional download package with reduced loot. All containers with generic low quality, junk loot tables will be empty unless they are connected with quest or Point of Interest. Drops from killed enemies are not affected. Shop prices are halved to compensate for the loss in items to sell and items that you'll now need to buy. Multiple changes that aim at bringing back the original intended feeling to character development and alchemy builds. Initially skills were designed as a single point investments. The excess of skillpoints player was given was meant to encourage swapping skills depending on the enemies and situations. To bring back that feeling max levels of skills were reduced giving more bang for the buck instead of small percent increases. Additionally there are few changes bringing high toxicity Euphoria build down to be on par with other builds and buffs for mutations that didn’t feel strong or unique enough. • Decreased skills max levels (most had 5, now 3) and adjusted stats to retain the same balance. Utility skills like slowdown on aiming now have only 1 level. • Nerfed Acquired Tolerance skill to grant 0.5 Toxicity point per level to prevent safe activation of more than 3 decoctions at the same time in end game. • Quen doesn't remove damage over time effects on cast, instead it protects player while DoTs consume the shield. Resistances on armors should matter more now. • Reduced healing from damage on alternate Quen from 100% of received damage to 0.1 * damage * Spell Power. This mechanic was clearly overpowered and made player nearly immortal. • Increased Sign intensity to enemy resistance ratio required for heavy knockdown -- the one allowing to instantly kill knocked enemies. Insta-kill knockdown now requires dedicated Signs build. • Changed the way chance to apply burning effect is calculated for base Igni Sign. Sign intensity impact on chance is now logarythmic, instead of linear, which means that high Sign intensity will result in diminishing returns. Without this change Pyromaniac skill was useless for dedicated Signs build, because it was very easy to reach 100% chance to apply burning from Sign intensity on basic Igni anyway. • Static Discharge skill now removes a portion of enemy's current health instead of dealing very low flat damage. Damage depends on Sign intensity and can vary between 2% (lowest possible) and 10% or more of current enemy health per cast on maxed out Signs build. This makes casting Aard with Static Discharge a very good idea against tanky enemies, especially at the beginning of combat. Vanilla damage of Static Discharge was extremely low, so investing in this skill was a waste. • Supercharged Glyphs skill damage is now scaling with enemy max health in addition to vanilla damage value. Vanilla damage of Supercharged Glyphs was extremely low, so investing in this skill was a waste. • Decreased toxicity overdose damage threshold from 75 to 50. That was the initial original idea for toxicity handling encouraging player to take risk and correctly time potion use. • Equalized out of combat and combat toxicity drop rate (used to be twice as fast). • Crippling Strikes skill: Deals regular bleeding effect damage that cannot go below the dmg value specified in skill description. Also effect duration was increased from 5 to 10 seconds to match the duration of regular bleeding. General idea is that effect originating from skill shouldn't be weaker than bleeding from item. • Adrenaline Rush mutation: Adrenaline Points drop after 4s delay. Introduced new potential skill combos and play styles instead of another percentage damage buff. • Deadly Counter mutation: A counterattack immediately triggers a finisher with a chance based on the number of Adrenaline Points. Opponents immune to counterattacks are not affected. Used to work only on opponents below 25% health. • Piercing Cold mutation freeze chance is now scales up to 30% (up from 25%) but depends on amount of Adrenaline. Chance scales all the way, not only when full Adrenaline Point is gained. This change is meant to make you earn insta-kill chance, not just randomly one-shot enemies from the start of combat. • Toxic Blood mutation: doubled the returned damage value (3% per toxicity point, was 1.5%) to compensate for reducing maximum achievable toxicity. • Buffed Second Life mutation by reducing effect cooldown from 180 sec to 60 sec. Effect immortality buff lasts 10 seconds (unchanged), so effective downtime is 50 sec. This might seem very powerful, or still not powerful enough, but pushing it further might end with total immortality, while keeping longer cooldown results in nobody using this mutation. • Buffed Metamorphosis mutation by increasing number of bonus decoctions cap from 3 to 5. This is a very costly mutatation with its cost implying that it's very powerful. It didn't feel like it and very few people ever used it. Mutation description updated to reflect this change (string 1188321). • Fixed vanilla game bug with Flood of Anger skill not buffing Signs skills that are learned but not slotted and not upgrading slotted skills that are below max level. • Fixed vanilla game bug with Flood of Anger skill not adding Exploding Shield and Quen Discharge skills for the duration of Quen shield (worked only on cast, ignored duration). • Fixed vanilla game bug with Flood of Anger skill not adding Supercharged Glyphs skill for the duration of Yrden trap (worked only on cast, ignored duration). • Fixed vanilla game bug with interaction between Flood of Anger skill and Rage Management perk. • Fixed vanilla game bug with Hunter Instinct skill not properly adding critical hit damage. • Fixed vanilla game bug with Aard damage from Shockwave not being added when Piercing Cold effect is triggered but fails to insta-kill opponent. • Fixed vanilla game bug with Synergy skill not providing synergy bonus to mutagen itself (despite it being displayed in skill panel), only to skills. Couple of bugfixes and removing arbitrary stat bonuses. • Removed huge arbitrary stat buffs on enemies with skull icons. They are already higher level than player, that alone makes them more difficult. • Allowed to parry and counterattack enemies with skull icons. • Fixed leshen root damage being a fixed value throughout the whole game, so it doesn't matter if you are attacked by level 10 or level 50 leshen. It's taken from his melee attack damage so it scales with enemy level. • Made bird swarm attacks ignore armor. Leshen bird attacks dealt zero damage starting from mid-game. • Fixed vanilla game bug with sprigan's root ground attack dealing no damage. • Restored monster essence (silver health bar) regeneration (mostly for werewolves). It was temporarily disabled at some point in implementation and never brought back. • Fixed discrepancies between NG+ and base game xml files, like missing ability definitions, ability tags, etc. These potentially caused minor bugs in enemy stats in NG+. • Halved enemy resistances bonuses per level against Signs in NG+. Applying critical effects in NG+ was (close to) impossible due to resistances reaching and exceeding 100%. That said, this change shouldn't make the game easier than it is in NG, it just ensures that enemies in NG+ are as resistant to Signs as in NG. • Changed projectile damage of special attacks being a fixed value throughout the whole game. It now scales with level. • Fixed vanilla game bug with physical projectiles from special attacks not dealing damage to monsters, ie. Kiera's "rock barrage" attack. • Djinn and rats is not affected by enemy upscaling option. Bunch of small changes that put more emphasis on some of the gameplay mechanics that didn’t work as originally intended due to balancing issues. • Loot item level is now upscaled to highest enemy level in the area if enemy level is higher than player level. Fighting higher level enemies guarantees high level drops now. • Increased random range of item levels rolled for quest rewards. You might end up with an item you cannot use yet, but at least you'll get a guaranteed upgrade on level up. • Increased stat debuff on damaged items. Value depends on game difficulty level with 50% debuff on highest difficulty. Repairing items matter now. • Increased amount of gold given in quests where it made sense (Baron should be more generous, etc.). Didn't touch the mini-quests and quests where you negotiate reward. • Reduced the amount of healing per second from food but increased healing duration. Overall it's a slight buff for food without Gourmet perk and a significant nerf with it. Swallow and White Raffard potions are intended healing in combat, not chicken sandwiches. Changes are focused on fixing near immortality issue coming from high rending (monster) damage reduction combined with Protective Coating skill. Also there are two sets partially focusing on buffing alchemy builds. Mod moves alchemy bonuses to Manticore set making it a dedicated alchemy set and introduces new bonuses and playstyle to Wolven set. I remember reading about the idea of Wolven set built around bleeding damage on Witcher Reddit, so cheers to the Reddit community. • Scaled down monster damage resistance on witcher armors where applicable. Upgraded witcher sets used in conjunction with Protective Coating oil used to reach 100% rending damage reduction (some damage still passed due to resistance cap). That shouldn't be the case now. For details on numbers check attached images. 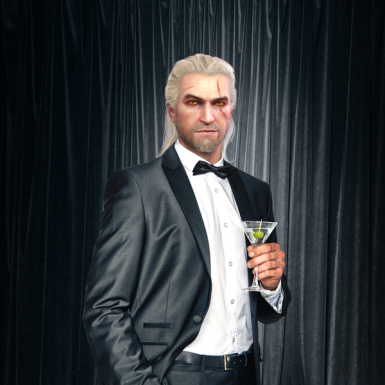 • Enabled grandmaster set bonuses on all witcher sets items in New Game+. • Moved 3 item Wolven set bonus (bombs are thrown without a delay) and merged it with 3 item Manticore set bonus (bombs are affected by critical hit chance and critical hit damage). • Reduced Manticore set Toxicity bonus from 30 (and more on NG+) to 20, to prevent safe activation of more than 3 decoctions at the same time in end game. • Moved 6 item Wolven set bonus (3 different oils can be applied to a sword) to Fixative alchemy skill. Should make Fixative skill a more interesting choice in character development. • New Wolven set 3 item bonus: Each stack of Bleeding effect applied to enemies increases sword damage by 1% for each piece of the set. • New Wolven set 6 item bonus: Each Adrenaline Point increases number of possible stacks of Bleeding effect that can be applied to single opponent. With new set bonuses Wolven set tries to fulfil the fantasy of specialized Damage over Time build working well in conjunction with buffed Crippling Strikes skill. Buffed every runeword and glyphword about which I thought “I’d never use that when I have that other, better choice”. Beside buffing, Possession runeword had its effect changed because there used to be 2 glyphwords buffing Axii in different ways and 3rd being a sum of previous two, so it just wasn’t interesting enough. • Rejuvenation runeword: Fatal blows restore 100% stamina (was 25%). • Dumplings runeword: changed duration bonus to 5x increase in healing speed. With this buff food is brought back to the same healing speed as in vanilla game while also having significantly increased effect duration. • Elation runeword: Fatal blows give 1 Adrenaline point (was 0.1 to 0.25). • Prolongation runeword: Unblocked blows increases potion duration by 1s (was 0.5s). • Ignition glyphword: Enemies set alight with Igni have a 100% chance to ignite other enemies within a 2 yard radius. (was 25% chance). • Rotation glyphword: Igni strikes in a 360 radius (removed "but doesn't induce Burning" tradeoff). Burning is the main damage source for Igni, not the impact damage. Without burning Rotation runeword made Igni useless both as damage dealer and crowd control Sign. • Possession glyphword, new effect: When effect of Axii ends, opponent receives damage dependent on effect duration and Sign intensity. Spent long time balancing the damage potential. It’s a nice bonus when you don’t invest in Sign intensity and a killer when you do. It’s very effective at the cost of waiting - you could finish off enemies faster by other means. As a bonus eye candy, enemies that die to Possession effect explode. • Retribution glyphword: 100% chance for half damage returned (was 30% chance for ⅔ damage returned). A small damage nerf in exchange for consistency and reliability. When you allow yourself to be hit to deal damage, you want it to be reliable, not bet on random chance. • Eruption glyphword: explosion deals the same damage as rotfiend's explosion added to original damage. Used to be only 50 dmg multiplied by Sign intensity. • Depletion glyphword: casting Aard depletes enemy’s stamina (was 50% stamina damage). The idea behind the glyphword was to allow player to overcome enemy defence even if he didn’t manage to knock him down (stamina is used for offensive and defensive actions). With just 50% stamina damage enemies could still parry after casting Aard, so it didn’t feel like it made any difference. • Fixed vanilla game bug with Rejuvenation runeword increasing maximum stamina beside also regenerating it on kill. • Added a failsafe to prevent Rejuvenation runeword bug from happening on Elation runeword (just in case). Bombs deal a decent amount of damage up to the middle of main game and then they fall behind Signs and sword damage becoming useless as damage dealers in end game, both expansions and NG+. These changes aim to make bombs a perfectly viable build if player chooses to invest enough skill points in alchemy build. • Beside increasing potion duration each active alchemy skill also increases damage of bombs by 5% per skill level. • Added DoT value scaling with enemy max health on top of existing damage value to Devil's Puffball bomb. This is how majority of other DoTs work in the game. • Heavy Artillery damage bonus acts as a final damage multiplier calculated after bonus from alchemy skills. • Doubled damage values of bombs and Pyromancy skill in NG+. • Moon Dust bombs block abilities of cursed monsters and shapeshifters. These monsters are especially vulnerable to silver. • Northern Wind bombs block rotfiend enemy types explosive deaths. Beside the cosmetic improvements the main intention is to make crossbow damage useful but not competing with swords, Signs and bombs unless you invest in crossbow related skills and use high quality bolts. • Crossbow bolt's damage scales with player level. Damage is dependent on bolt quality. • Slowed down crossbow bolts when shot underwater. • Increased crossbow bolts range from 25m to 50m when not underwater. Beside buffing underperforming decoctions, didn’t like the way Blizzard potion was triggered. It was useless in 1v1 monster hunts and boss fights. I wanted to remedy that. • Blizzard potion now activates slow motion when Geralt is in danger, no need to kill an enemy anymore. To compensate, effect's strength and duration was slightly decreased. Blizzard should be more consistent and easy to use now but also not that overpowered. • Cat potion grants 5%/7%/10% crit chance bonus. A little bonus that should make Cat potion a bit more useful. • Katakan decoction increases critical hit chance by 10% (up from 5%). • Leshen decoction reflects 10% of damage dealt by enemy (up from 2%). • Grave hag's decoction increases Vitality regeneration by 10 per enemy slain (up from 5). • Reliever's decoction blocks specter's special abilities, like ethereal forms and teleports upon hitting them on top of its vanilla bonuses (string 1083121). • Fixed a very rare vanilla timescale bug that caused all slowmotion effects from skills and items (Blizzard) speeding up Geralt instead of slowing down time. Meditate in game to fix this issue. • Added console command that will completely reset character development, including reloading xml definitions affecting skill max levels. Type "ResetCharacterDevelopment" or "rcd" (lazy version) without quotation marks in console to activate it. You'll know that it worked from camera shake effect. After typing it save and reload the game.